Traveling in Taiwan at the moment. Shao Ping and I are visiting her family here in Taipei. 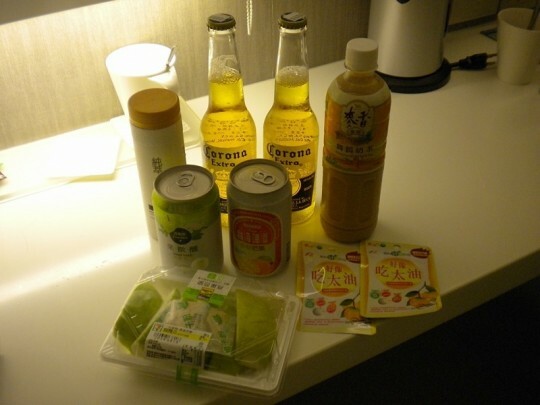 Grabbed some snacks and some drinks to take back to the hotel (which, by the way, is brilliant… that will be a future post). We bought the snacks in a local 7-11 store. Now, 7-11 stores in Taiwan, and Japan for that matter, are an adventure in themselves. You can purchase just about anything. Anything. They also provide courier services. Food, drink, beer, snacks, nik-naks, and so on. One can spend ages in a Japanese 7-11 captivated and intrigued by what is on the shelves. Their equivalent in Australia is dead boring to say the least. They primarily cater to bogans and hoons in Australia. I enclose a photograph of tonight’s purchase which includes two Corona beers. The total cost was $348.00NT (Taiwan New Dollars) or $11.35AUD (Australian Dollars). Inexpensive. Meals are also inexpensive here. One can purchase a complete hot meal, with soup, and drink for less than three Australian dollars. You would be lucky to get a fart from a chef in Australia for less than three dollars.